It feels like that story has been told every which way you can imagine. You mean like "Evil person(s) take(s) a group of (mostly) innocent people hostage and doesn't realise that he forgot the one who lets a NAVY S.E.A.L. look like a buddhist monch"? And even if they can't put a new spin on it, it doesn't have to be boring. Overview Lt. Col. Glenn Manning is inadvertently exposed to a plutonium bomb blast at Camp Desert Rock. Though burned over 90% of his body, he survives, and begins to grow in size. As he grows, his heart and circulatory system fail to keep pace with his growth, and he is gradually losing his mind as a result of reduced blood supply to his brain. He reaches 50 feet tall before his growth is stopped. By this time he has become insane. He escapes and wreaks havoc upon Las Vegas before he is finally stopped. 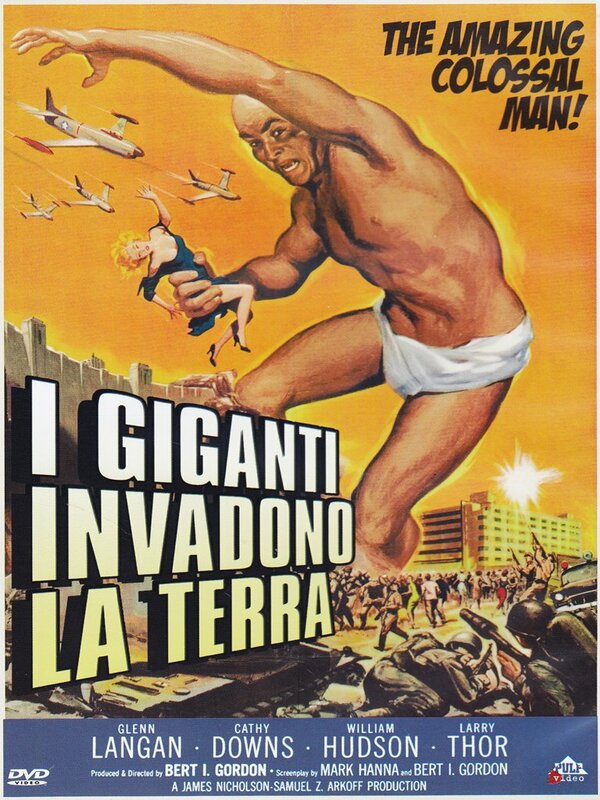 My thoughts It would be a gross overstatement to say that The Amazing Colossal Man is a good movie. It's not. But it's a fun little movie. The script is way out there. Not only is the whole notion of anything growing like that totally bogus. It also makes some really WTF claims. “His heart grows slower than the rest of the body because the heart is a single cell.” What on earth was the scriptwriter smoking when he came up with that? Most of the effects are also laughable. Worst of all, the final effects shot, when the Colossal Man falls down from the Boulder Dam, is so pitiful that it taints the whole experience of the film. This movie is really hard to find on DVD. I got hold of an Italian release. I was dismayed when I started the film, because it was widescreen 1.78:1, and I knew it was supposed to be 1.37:1. Strangely enough it seemed to work. The composition hardly ever felt cramped. It was as if it was shot with matting in mind. However, I have never read anything that suggests that it was actually meant to be shown that way. You probably have to love 50's black-and-white genre movies in order to appreciate this film. It is a turkey, but it's a lovable turkey! Update: found a copy at a place never dealt with .. guess will see how that works out. Btw, in Colossal Man the dam is refered to by its original name, Boulder Dam. Any reason for that? Wasn't it renamed Hoover Dam about a decade before the film was made? "Btw, in Colossal Man the dam is refered to by its original name, Boulder Dam. Any reason for that? Wasn't it renamed Hoover Dam about a decade before the film was made?" The naming was more political than anything else. I couldn't remember the bits but found this on wikipedia Naming Controversy. I can remember as a kid it being called Boulder Dam. Maybe I should send her flowers to placate her? I find it works well to blame others when I buy new Blu-rays...and that person has been Jon for a few years now, since I broke down and double dipped for North by Northwest. As was to be expected. You find here a bunch of confessing DVD-Addicts that are far beyond help.